STRESS AND RESCUE DIVER Prevent problems, and manage them if they occur. 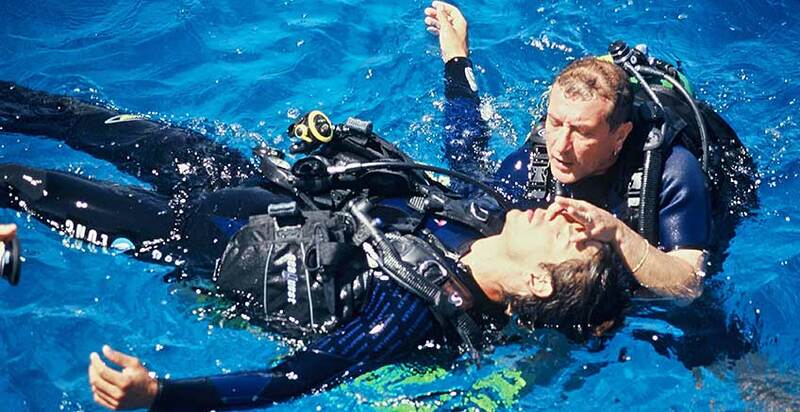 This program teaches you the skills and knowledge required to recognize and deal with stress, prevent accidents and properly deal with emergency situations encountered by divers. You will earn the Diver Stress and Rescue Specialty certification after completing this program. Seklf study, followed by two evenings of class work, during which you will review the homework and discuss upcoming dives and skills. Except as noted, classroom sessions take place either at our Willoughby or Fairview Park locations. Locally conducted open-water training dives generally take place at White Star Quarry. The cost for this course is $355, which includes course materials and pocket mask. Students are responsible for transportation, lodging, meals, dive site admission, and must supply the items listed below. One cylinder per dive, per day. All of these items are available for purchase at Just Add Water; some may be also be available for rental.